In many parts of the world, dash cams are a must. Here in the US, scam artists are not as common, but dash cams still have a great value. 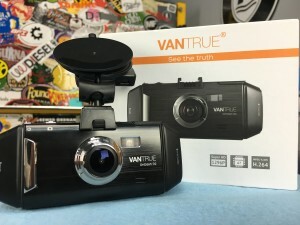 Today we are going to be looking at and reviewing the VanTrue Ondash R2 Car Dash Cam. Using a dash camera to catch scam artists is only one use. We also use them for car shows, auto and rally cross races, or even scenic drives. I will be adding this camera as part of the Podcast videos I shoot in the car. Trouble viewing? Watch “DashCam Review ~ VanTrue Ondash R2” on YouTube. The OnDash R2 comes with all the cables you will need including a 12v cable, a USB cable, and a HDMI cable. You also have a bunch of different video settings to choose from including recording in 2k video. For the review I used the full HD setting. The on board mic is pretty good. I would not record a podcast with it, but for most folks it will be prefect. Mount is a proprietary mount, I could not find a place to buy separately.